My friend has a necklace (black and red beads, medium, with small gunmetal grey beads in between) that she got from in NYC that I want to make myself. It’s really long, and the beads are on a cheap looking silver chain with small links, but not tiny. There are “stopper” silver links around each bead to keep them in place on the thin chain. Failing finding this (because I know it’s WAY specific), I’d just like some really good, modern (and not “old lady” looking) patterns for beaded necklaces. Any sites you know of? Thanks! I know AC Moore and www.firemountaingems.com both have the supplies you need. I have had really good experiences with ordering from Fire Mountain Gems and they have lots of free ideas on their site as well. The silver “stoppers” are small crimp beads. You can smash the crimp beads with a pair of long nose pliers, but you will get a much nicer result with crimp pliers which are made to fold the crimp in on itself. Right now AC Moore and Michael’s both have a good selection of Chain styles available (that are inexpensive), because they are very popular right now. Fire Mountain has where you can order by the foot or in quantity. The beads all sound like druks (round glass beads that are made in Czechoslovakia. They come in a variety of finishes and sizes. I have ordered those colors (black, red, gun metal) from Fire Mountain Gems. You can probably find something similar at both of the craft stores as well. Be sure to get some wire and some round nose pliers to create charms out of the beads, if necessary. Otherwise you will just open the links of chain with the pliars and slide the beads on. You will need the round nose pliers for all sort of bead work, so they are really worth it. Without seeing the end project, I hope this will help. 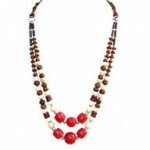 Does anyone know of any websites that have free glass bead necklace patterns? I am having so much fun making necklaces! It’s my new hobby. I really like this site, and the stuff you order (only if you want) is really good quality.